About half of the projects on my plate/in mind at the moment are secret, and as such can't be discussed. Makes for pretty boring blogging, not to mention that I've been abandoned by my husband for a week and am trying to wrangle two children on my own. However, there has been some knitting going on, mostly late at night with the companionship of Vampire Bill et al. First thing I've been working on is the first installment of the Knit Love Club 2010 sock club. It arrived a couple of weeks ago, and I've been loving it. The yarn is Alchemy Juniper, colorway "Rumplestiltskin" (club exclusive), and the pattern is by Socktopus/Knit Nation braintrust Alice. 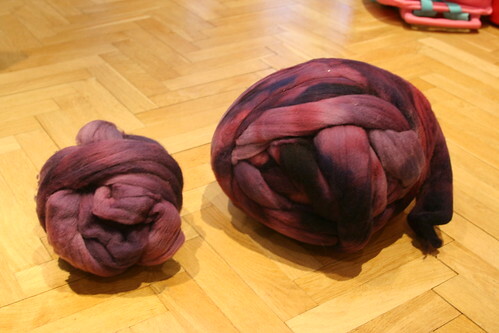 The yarn is lovely (if a bit splitty for doing k4tog/ssssk, but what wouldn't be?) 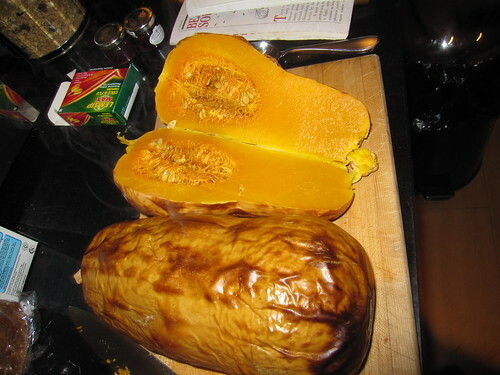 and the exact color of roasted butternut squash. Really. See? The pattern is fun to knit and looks way more complicated then it is. I've had to do some adjusting to make the leg a bit longer and make sure I don't run out of yarn, but I'm well into the foot now and I think I'll have plenty. Maybe even some leftovers for The Blanket. Project #2 is the big spinning project. I try to do about an hour a night on this at least, and I've now filled five bobbins. That's the good news. 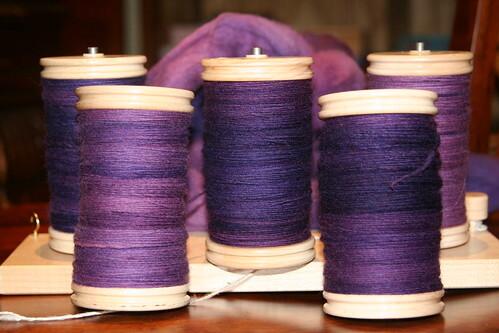 The bad news is that I still have this much fiber left to spin, and only three more bobbins available. That bump on the left is 171 gr and the one on the right (much compacted) is a whopping 472 gr (half of what I started with). Ooof. I was considering trying to get the spinning done during the Olympics, but we're going out of town for seven days for half-term holiday, and the wheel is not invited to Tunis with us. Instead, last night I started swatching for this for the Olympics. I have serious color choice issues in stranded knitting, so I'm going to knit this vest (which I've been lusting over for ever) instead. I did one swatch last night, and have ruled out three colors and one needle size so far, so we'll see what happens. There is much more swatching for another secret project in a yarn I've never used before, but I think I want to marry. And so on and so on. So apologies for the lack of new, shareable content, but it may be a couple of weeks before I get to anything more interesting then the socks, purple yarn making and random Fair Isle swatches. 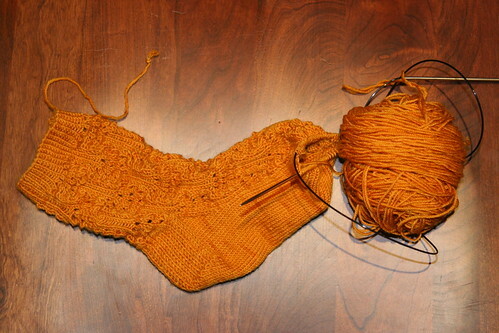 Written by porpoise On February 7, 2010 In "Knit Love Club", "Vine Yoke Cardigan", "socks", "spinning"